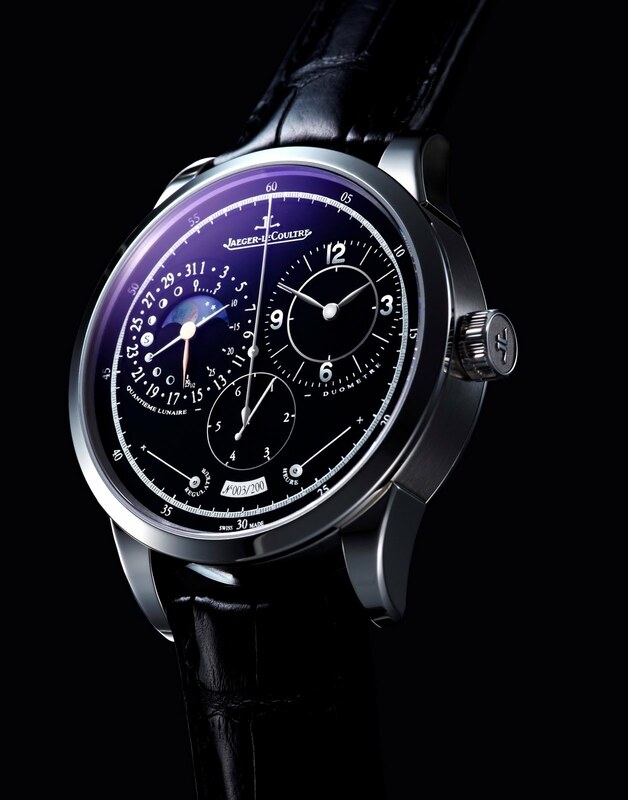 Watchuseek Watch Blog: Limited edition of 200 : Jaeger-LeCoultre Duomètre à Quantième Lunaire. 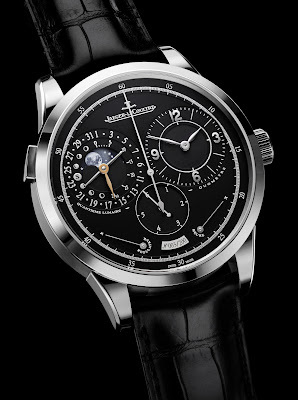 Limited edition of 200 : Jaeger-LeCoultre Duomètre à Quantième Lunaire. You know you have an important watch on your hands when the press release runs to over five pages of tightly packed text describing the watch in all its glory. Such is the case with the new version of the Jaeger-LeCoultre Duomètre à Quantième Lunaire. • Date and age of the moon for the northern and the southern hemisphere. And, despite an exceptionally complex calibre with two barrels and over 369 parts, it features easy readability and a sleek design. Calibre 381, visible through the sapphire caseback, features a large balance wheel of 10 millimeters in diameter and an inertia of 11.5 mg cm2 beating at a frequency of 21,600 vibrations per hour or 3 Hertz. The driving force behind the design is timekeeping accuracy. The Dual-Wing concept addresses an age-old problem in watchmaking: every complication reduces the amount and consistency of the energy reaching the escapement. Calibre 381 is dedicated to achieving the highest possible precision for a mechanical movement. The calibre is divided into two sections just like two wings – hence the name dual-wing. On each side sits one barrel with its mainspring guaranteeing a power reserve of 50 hours: one for hour, minute, seconds, jumping seconds, the date and the age of the moon, the other for the escapement device to ensure a constant power supply. Both springs are wound through the crown. Rotating it clockwise winds the timing barrel (escapement). Turning the crown counter-clockwise winds the power reserve of the functions (hour, minute, seconds, jumping seconds, date, moon phase). Coupling the two mechanisms via the jumping seconds hand mechanism means the watch can be adjusted to a timing signal without stopping the escapement. The watch features two seconds hands. One at the centre and a second one at 6 o’clock: a jumping seconds hand accurate to 1/6th of a second. Setting the time is achieved by pulling the crown then both seconds hands, the centre seconds hand and the jumping seconds hand jump to the zero-position leaving the escapement running. Pushing the crown activates both hands simultaneously by re-coupling into the running escapement. Once released, the wheels of the hands interlock with the active mechanism and begin to turn on the spot at the speed of the clock, which is 3 Hertz. This accuracy is reached instantaneously because the balance has been working even with the hands on hold. With the traditional second’s stop, which freezes the balance wheel, the watch needs several minutes before it is back in its original rhythm. The complication of the Duomètre à Quantième Lunaire shows the most important calendar function – the date – and the most romantic one: the age of the moon. The date indication runs around the sub dial on the left side of the watch. A long hand in the centre indicates the age of the moon. The watch features a traditional star wheel with 59 teeth, which shows a full moon cycle in 29.5 days. Because the length of the cycle in nature is 29.53 days, an error of 44 minutes and 2.8 seconds per month (or 9 hours per year) occurs with the indicated age of the moon. It adds up to a full day in the course of three years. This deviation is corrected through a pusher on the side of the case at the 12 o’clock position. The Calibre 381 is beautifully finished. The two independent barrels are snailed and bevelled by hand, while the ratchet-wheels are brushed with sunray-patterns and engraved and gilded “Mouvement” and “heure/minute” respectively. The wheels and pinions feature snailed and polished surfaces. Flame-blued steel screws and a base plate of untreated nickel-silver highlight the traditional finishing techniques. The 42mm case, waterproof to 5 bar, uses a push button at 10 o’clock to set the date and a pusher between the lugs at 12 to adjust the moon phase. Matte black or chocolate brown alligator straps are fitted to a double folding clasp. The Duomètre à Quantième Lunaire Limited Edition will retail for 32,000 euros, and orders can be taken as of now. The reference number is Q6043570.